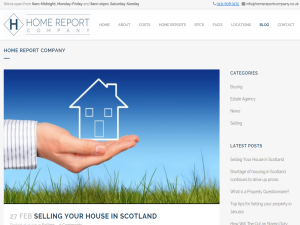 A blog which provides hints and tips and valuable resources about home reports in Scotland. Home reports are mandatory in Scotland when selling your property. The blog discusses all aspects of selling your home and is a valuable resource. This what your Home Report Company Blog Blog Ad will look like to visitors! Of course you will want to use keywords and ad targeting to get the most out of your ad campaign! So purchase an ad space today before there all gone! All sellers want to achieve the best possible price for their property, to sell in the quickest time possible and achieve the highest price offered. This means using an experienced selling agent who has extensive market knowledge, access to all the most popular selling platforms i.e. ESPC, Zoopla, Rightmove etc and experience to negotiate the best offers on your home. There are also a number of simple steps that you as a seller can do in order to make your home more appealing to potential buyers. Here are our top five simple bits of advice to help you maximise your home’s selling price. Bit of an old cliché but you really don’t get a second chance to make a good first impression. It’s so important that the front of your property looks as open and welcoming to buyers as possible. If you have a front garden, make sure that it’s well looked after, and that the lawn has been recently trimmed. Using flowers to add a splash of colour can really brighten up the outside of your home. Even in winter there are hardy but beautiful flowers like heather, viburnum and pansies which can be used to brighten things up and welcome potential buyers. Ensure pathways are free from weeds or trip hazards and that wheelie bins are hidden out of sight. If your front door or window-frames are looking a little worn it’s well worth taking the time to give them a lick of paint. If you’re not too handy in the DIY department, you can spend a few extra pounds having someone come out and do it for you. Selling a home can be emotional, especially when you’ve lived in a property for a number of years and you’ve developed a real attachment to it but try not to be too sentimental. Trying to keep the mindset of your buyer in mind is always difficult, but ultimately you are trying to present an image of the house that your buyer will one day live in and the lifestyle that they will enjoy when they have moved their own furniture in. Once you’ve lived in a property for a number of years, you’ll inevitably find that you accumulate a lot of stuff. You’re not always going to be aware of how much because it’s become almost part of your home. Maybe you can get a friend to give an honest insight? Hide away lots of belongings by asking a friend to look after them, putting them into storage, or just having a good old fashioned clear out! Charity shops will be grateful of any donations that they can re-sell. For larger items or unnecessary items of furniture, put them into storage which will also really help to make your home look more spacious and easier for potential buyers to picture how the space will look with their own belongings in place. You don’t need to start any major renovation or development to make your home more appealing to buyers. Instead, consider freshening up the interior. Make your home look light, airy and warm. Paint parts of walls or doors that are looking jaded, hang mirrors up to give the feeling of space and strategically place extra lighting, such as a lamp, in corners. Clear bins and drains, air the room of any unpleasant odours or stale cooking smells. Try adding fresh flowers or plants throughout the house. Pull the curtains right back to let the light in and switch the lights on in dark areas. We offer a quick and affordable home report at a time which suits you with offices throughout Scotland. Call us on 0131 608 0175 or email us info@homereportcompany.co.uk. Following the warmest February on record, March saw some snowfall in parts of the UK. Storms Gareth and Hannah also wreaked havoc across Britain. Direct Line for Business is advising landlords that prevention is better than cure, warning they shouldn’t be complacent when it comes to maintaining their properties’ heating systems. 81% of the entire year’s boiler claims were made in winter last year and the cost of repairing a faulty boiler currently stands at about 60% more than the average UK monthly rent. It is a legal requirement for landlords to be responsible for securing an annual safety certificate for gas appliances and are also required to ensure the heating and hot water systems are maintained and functioning in the correct manner. Direct Line for Business provides boiler breakdown cover as standard with any building’s insurance issued. As long as any damage isn’t a maintenance issue or due to wear and tear, they will pay the cost of fixing the issue, or if repair is not possible, then they will replace the broken boiler. They will also pay for any supplementary heaters to help tenants try and stay warm while the issue is being resolved. Any sudden change to cold temperatures can freeze your boilers external condensate pipe, which could cause your boiler to stop working. By insulating pipes, this can also help prevent burst pipes as keeping the heating on constantly but low when it’s very cold. If your radiators are not giving off as much heat as you feel they should be, or if the top of the radiator isn’t getting warm, there might be air trapped inside the heating system. By releasing air from the system, it’ll help keep radiators hot and water within the system well circulated. Bleeding radiators is a simple task, but you’ll need a key which can slot into the radiators bleed valve. If you still have a problem after doing this, you may need to call in the professionals. Ensure you service your boiler and keep it regularly maintained in line with the manufacturer’s recommendations. Inspect your boiler regularly for any error lights on the interface. Check for leaks, cracks or strange noises because the earlier you notice a problem, the easier it will be to fix. If the property is going to be left unoccupied for an extended period, you may want to consider draining the water system and switching the appliances off. However, if it’s in the winter months, when frost might occur, then keeping your central heating system on low as this can help prevent frozen pipes. Most insurers will have terms and conditions that apply if the property is unoccupied for an extended period so check your policy to make sure that follow recommendations and are covered should there be an issue. In preparation for selling your home, there are many things you can do to make it more energy efficient and improve EPC rating. Have a look at our energy savings advice to see if there’s anything you could apply in your home. Instead of leaving appliances on standby, turn them off. Insulating your home properly is a good long-term investment for reducing the heat that escapes from your house, saving your energy consumption and lowering your heating bills. Lighting typically accounts for 15% of a household’s electricity bill. You can cut your lighting bill and energy use by changing to energy saving LED bulbs. The most popular light bulbs available are halogen incandescents, compact fluorescent lamps (CFLs), and light-emitting diodes (LEDs). Although they can initially cost more than traditional incandescent bulbs, during their lifetime they save you money, because they use less energy. Solar panels use energy from the sun to create electrical power, which you can connect up to your home’s main electricity supply. In Scotland you should be able to generate around 3,200 kilowatt hours (kWh) of electricity per year. wind turbines harness the power of the wind so it can be used to produce electricity. This would ideal for home owners with a bit of land. the only cost to you is to get the turbine installed, but once you’ve done this, it should generate more than enough power to make all your electrical appliances and lights work. The cost of installation of a wind turbine can set you back between around £3,000 for a roof-mounted one or pole mounted systems can cost anything between £10-30K. As with solar panels, you will receive a tariff from the government for each kWh of electricity generated by your turbine. Find out more about wind turbines at Renewable UK. Heat pumps extract heat from the ground or air, supplying you with heating and hot water. You should be able to cover the £7,000 to £11,000 cost of fitting one in around five to seven years of savings and running costs will depend on how warm you want your home to be, how big it is, and how well insulated it is. You’ll still have to pay electricity bills because heat pumps are powered by electricity, but your savings will come from the fuel you are replacing. According to the Energy Saving Trust, if you’re replacing a non-condensing gas system with a heat pump then typical fuel bill savings are in the region of £335 to £495 a year, or from £70 to £100 a year if you’re replacing a condensing gas system. Heating accounts for around 55% of what you spend in a year on energy bills, so an efficient boiler makes a big difference. According to the Energy Saving Trust, if you replace your old model with an A-rated boiler and set of heating controls (you can even operate it remotely via an app on your phone) you could save about £340 and 1,500kg of carbon monoxide a year. An average home loses 10% of its heat through windows and doors. Good, energy efficient glazing reduces this heat loss, keeps the home warmer and reduces heating bills. It can also make the home quieter. Double-glazed windows have two sheets of glass with a gap between them which is usually 16mm wide. It’s the gap that creates an insulating barrier to slow down the rate at which heat escapes from the home. Triple-glazed windows are now also available which have three sheets of glass, and therefore two insulating gaps, to provide even better insulation. The Energy Performance Certificate (EPC) is required when selling or renting a property and includes a rating given to the property on a scale of A to G. It measures the quality of the property’s energy efficiency and includes recommendations on ways a property can be improved to cut fuel bills, improve efficiency and reduce carbon emissions. For more information on how a high EPC rating can increase your property’s value, see here. If you are looking for a RICS qualified surveyor to carry out a property survey, get in touch today by calling us on 0131 608 0175, email us at info@homereportcompany.co.uk or send us a message online. With today’s importance on environmental consciousness, energy efficient homes are achieving higher prices on the property market. Energy efficient homes are priced at a premium because their ‘green’ upgrades offer both reduced utility bills and avoided maintenance expenses. These higher premiums also reflect the improved quality of life that green upgrades can offer homeowners, from health benefits to enhanced in-home comfort. Residential energy efficiency is an investment that yields financial benefits in the form of both immediate monthly savings as well as future profits when the house has been sold. The Energy Performance Certificate (EPC) is required when selling or renting a property and includes a rating given to the property on a scale of A to G. It measures the quality of the property’s energy efficiency and includes recommendations on ways a property can be improved to cut fuel bills, improve efficiency and reduce carbon emissions. Energy efficient homes are growing in popularity, with sellers highlighting the benefits of efficient upgrades in the face of rising energy prices. When the time comes to sell your house, you should inform your estate agent or solicitor of the energy efficient measures that are now a part of your home’s infrastructure. Details of upgrades such as insulation or draught-proofing will be passed on to future owners, along with their energy savings. In addition, these upgrades distinctly improve habitation comfort within the home and can be a potential selling point. While it is still a work in progress, growing evidence reveals that greater energy efficiency translates to higher home values. This correlation is increasing over time. Unlike improvements such as adding a bedroom or updating a kitchen, which are typically expected to add value, the value of energy efficiency improvements relates to energy cost reduction. This means that a given reduction in energy use, whether the result of a major improvement or a simple (i.e. low cost) one, can have the same impact on home value. The reason for this is that regardless of how the energy cost was reduced, the lower cost of energy means the homeowner has more monthly budget available for other expenses, such as a bigger house. Energy-efficient homes produce immediate positive cash flow for home buyers because the reduction in monthly fuel bills more than offsets the higher monthly mortgage payment needed to finance such investments. A mortgage valuation survey is a brief report carried out by a qualified surveyor to inspect the property you’re looking to buy. It’s specific to the property you’re looking to buy and gives the lender confirmation of the property’s current value, also taking into consideration recently sold prices of similar properties in the same area. It’ll also take into consideration any defects which may affect the property’s value. The lender needs to ensure they are not taking any risks lending on a property that may have structural issues or are above a shop/restaurant or in a state of neglect. The valuation is commissioned by the lender and paid for by you and is simply about confirming the value of the property. This is important to understand because it is unlikely that you will ever get a copy of it because the RICS surveyor is working for the lender, not you. What’s involved in a mortgage valuation? The objective of the valuation is to confirm the amount offered by you is a fair market value for the property; the bank wants to ensure that if they need to repossess the property, that they can sell it again quickly on the open market and be able to clear their mortgage charge. A mortgage valuation flags certain defects within a property that the Surveyor feels could affect the property’s value, however it is not a detailed defect report. Is the house worth the price you’re paying for it? Is the house going to fall down any time soon? Let’s quickly look at each of these two questions in a bit more detail. Is the house worth the price you are paying for it? From a lenders point of view, they purely need to know that they aren’t lending someone £150,000 for a house that’s only worth £80,000. If they ever have to repossess the property, they want to be sure they will get as much of their money back as possible. That’s the most straight-forward explanation but there are other factors to take into consideration like loan to value (LTV). They just want to know that the valuation you or the buyer has placed on the property is a true reflection of the property’s current value. To confirm this, they will look at the overall condition of the property, whether it has been has any renovations carried out or requires modernisation and whether the number of bedrooms declared is accurate considering building regulations. They will also be looking at comparables of similar houses that have recently sold in the area. Is the house going to fall down anytime soon? A mortgage valuation survey will check for obvious sign of structural damage, damp, problems with the roof, problems with wiring etc. however no floor coverings will be lifted and no readings will be taken. If any potential issues are obvious, the surveyor may recommend that a more detailed report (a specialist damp and timber report for example) be obtained by the mortgage company before approving the mortgage. How much does a mortgage valuation cost? Generally, you will pay for the lender’s survey. The cost is based on the value and size of the property you are looking to purchase and costs typically £150 to £1,500. Prior to buying or selling a property, you’ll possibly never have heard of a chartered surveyor or know what their role is in the purchase/sale process. In this blog post, we will explain all aspects so that you are fully informed. A Chartered Surveyor is a highly trained and experienced property professional. They offer impartial, specialist advice on a variety of property related issues and the services which they provide are diverse. Chartered Surveyors work in all fields of property and building consultancy. At the most basic level, their duties include valuing property and looking for structural defects in buildings. They also provide expert consultancy advice in property, construction and related environmental issues. The representative professional body is the Royal Institution of Chartered Surveyors. The surveyor will visit the home you are thinking of buying, assessing all areas of the property and identify any problems or potential issues that may turn out to be a problem the future. They will then compile all relevant information into a report for you and from the surveys findings, you can then make an informed decision about whether or not you want to go ahead with the purchase. If there are one or several issues, it might give you scope to renegotiate the sale price based on the findings within the report. If issues are found with the property that are likely to cause you to have to fork out for repairs, e.g. £6K, you could negotiate the price of the property down by that amount. When do I need a Chartered Surveyor? You would use a chartered surveyor if you wanted a valuation for a future or existing project or renovation. Surveyors can value land, buildings, or machinery however, most will normally choose to specialise in one area of work. For example, a rural surveyor would value a farm and its assets, whereas a building surveyor might value an urban apartment complex. In addition to this, chartered surveyors can give assistance to companies or individuals at the design and implementation stages of a construction project, often suggesting how to maximise the land available and helping consult with the planning authorities. A surveyor can also assess the condition of an existing building or site and produce a report for a client, detailing problems (including structural or environmental), potential solutions and their costs. If you are selling a property, you will also need a surveyor to carry out the Home Report which is required in order to get your property on the market. What are the benefits of using a Chartered Surveyor? Using a chartered surveyor means that you are getting a professional opinion on an important and expensive investment like purchasing a house. Surveyors are property experts and will have had experience with the local authorities. They are well placed to advise you on valuations, the condition of a property, and how to deal with local authorities. The experience and expertise of chartered surveyors mean they will conduct a more thorough and accurate investigation than anyone else can, which in turn means that you get the best advice on how to act. This is really important when you consider the huge value of buying a property. A surveyor will also have access to services and information that you may not be able to uncover easily such as details of rights of way, affecting a property. What services should a Chartered Surveyor offer? identifies any risks and potential legal issues and highlights any urgent defects. It’s most suitable for new-build and conventional homes in good condition; no advice or valuation is provided in this survey. a survey suitable for conventional properties in reasonable condition. It will help you find out if there are any structural problems, such as subsidence or damp, as well as any other unwelcome hidden issues inside and outside. The Building Survey provides the same level of in-depth inspection as a building survey but uses a simple a clear presentation style and a 1, 2, 3 rating system to ensure that you can easily identify the most serious issues. This is mainly aimed at larger or older properties. an independent inspection to look for any issues with the property. the mortgage valuation is to satisfy the lender that your desired property is worth the price you’re paying – or at least the amount it’s lending, before they approve your mortgage. it won’t point out repairs or structural problems that you will have to pay to fix. In Scotland, a seller is legally required to produce a Home Report prior to your property going onto the market. Buyers have access to it free-of-charge. What qualifications do Chartered Surveyors have? It’s very important to use a qualified surveyor. You can usually find one through recommendation from your lender, solicitor or estate agent. Always choose someone who is RICS regulated means you know they have to follow the guidelines of that organisation. Chartered Surveyors may offer different advantages, as some can offer a very quick turnaround time on reports. If you are the owner of Home Report Company Blog, or someone who enjoys this blog why not upgrade it to a Featured Listing or Permanent Listing?